Variants are a fun thing to look for when collecting. 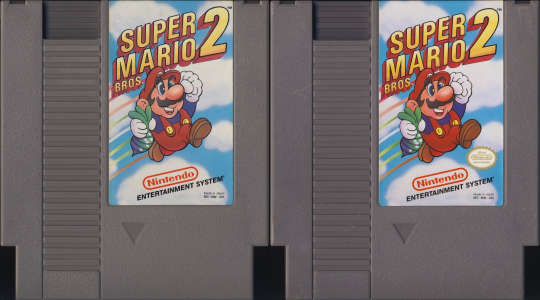 Today I am going to talk about some of the different variants you can find on the NES! Warning: This post is very image heavy. Collecting variants isn't for everyone. To the people that just want to play the game, they more than likely couldn't care less about them and the idea of deliberately picking up duplicates is crazy to them. To collectors, however, it's a whole different rabbit hole you can go down. Note that this is not meant to be a compendium of every single NES variant. This is merely showcasing some of them. The image above is the first variant I ever came across. When I was a kid, my first NES started malfunctioning. I didn't know exactly what it meant at the time, but I knew my system wasn't playing games like it should. 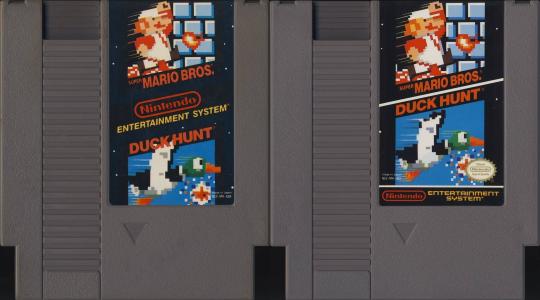 My parents then bought me a second NES, and the copy of Super Mario Bros./Duck Hunt that was included with the system was different than the one I already had. 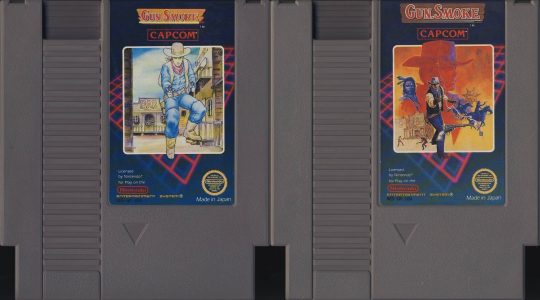 You can see several differences between the carts, such as the white line separating the games and the addition of the gold seal of quality. Left, five screw version. Right, three screw version. Left, no seal of quality. Right, with seal of quality. Left, original version. Right, USA-1 variant (note "Bros." placement). I could devote an entire article to five and three screw variants, but that will have to wait for the future! 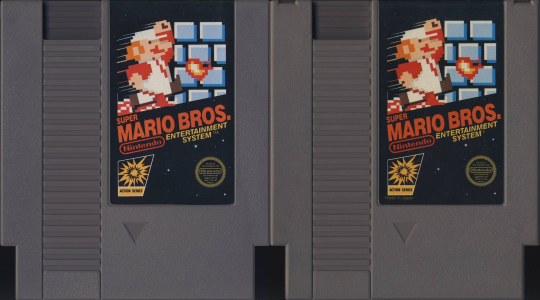 You can see in the image of the original Super Mario Bros. that the one on the left is flat across the top, while the one on the right has clips. Five screw games are held together with five screws (obviously), while the three screws are held together with three and two clips on the top of the cart. Screw variants are variants to look for, definitely, but it's a practice that I have just recently gotten into. There are tiny variants like this all over the NES library. There are also versions of games where one doesn't have a seal of quality, one does but it's the original round version, then another does but it's the newer oval version. Going after variants like these are something to look for in piles of games you already have. You've seen countless copies of Golf, but do you own the variant Golf? Searching out variants breathes new life into your searches, as coming home empty-handed all the time can be quite disappointing. Left, "Bar" art. Right, "Saloon" art. Left, black jersey. Right, white jersey. In this scenario, I have found that the Gun.Smoke art with the bar label to be the more difficult one to find. 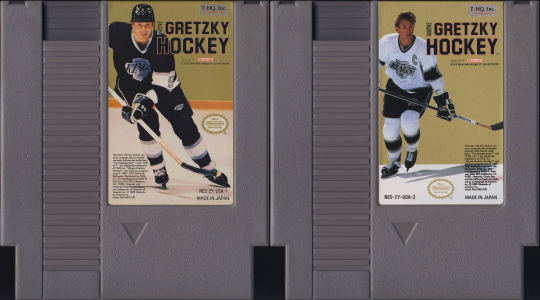 Also, the copy of Wayne Gretzky with the white jersey is the one I had a harder time locating. I can't say with authority that the white jersey is actually the rarer one, though, as I don't encounter this game that often in my searches. Along those same lines, Nintendo released a series of four games for the NES with new art in 1990. 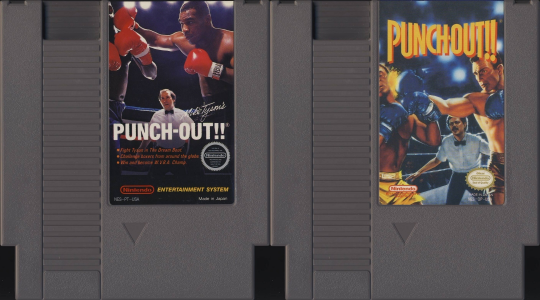 Both Zelda games were re-released in gray carts instead of gold, Mike Tyson's Punch-Out!! 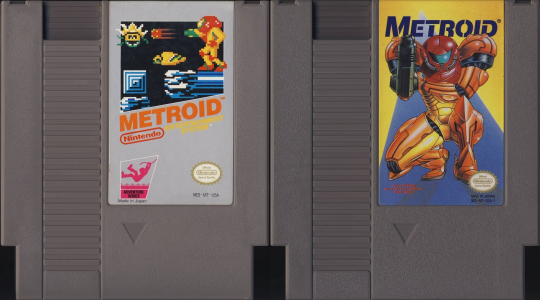 was released sans Iron Mike, and Metroid was given a completely redesigned label. The one on the left looks silver, but it's gold. The gold doesn't show up correctly on my scanner. "Mike Tyson is waiting for your challenge!" Or is he? Again, left cart is gold. In every case here, the updated version is the harder to find version. In my travels, I have only seen each of the re-releases a few times. That's not to say they're more desirable, though. 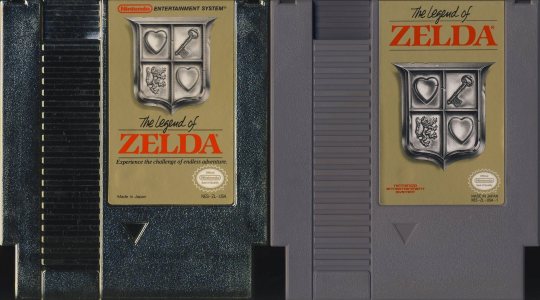 Few non-collectors would prefer a gray Legend of Zelda cart to a gold one given the choice. 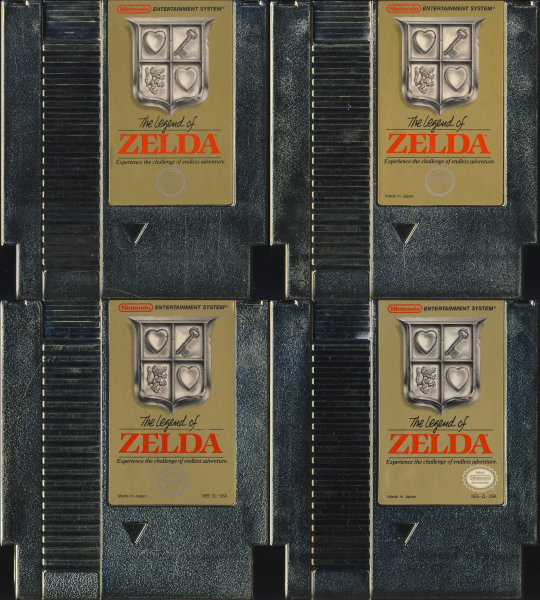 I own eight copies of The Legend of Zelda, and only one of them is the gray one. Several Legend of Zelda variants. Above are several Legend of Zelda variants. I did not buy any of them because I thought they were different. That was just an accident I discovered after I saw them all side by side. There is a five screw version of this game, but I do not own it so it isn't pictured. 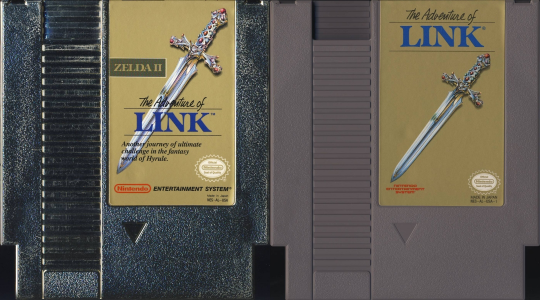 But in the above image, if you look closely at these copies of Zelda, you can see several differences. The first one has no text under the silver seal of quality. The second one says "Made in Japan" in the bottom left corner. The third one says "Made in Japan," but has NES-ZL-USA in the bottom right corner as well. Finally, the fourth copy has the updated oval seal of quality, as well as the "Made in Japan" and NES-ZL-USA text. None of those were bought with the knowledge they were any different. The variants were too small for me to notice at the time. I was just buying them because, well, you can never have too many copies of The Legend of Zelda! S.E.I. 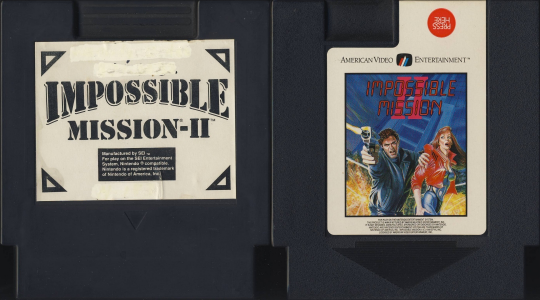 version and American Video Entertainment version. 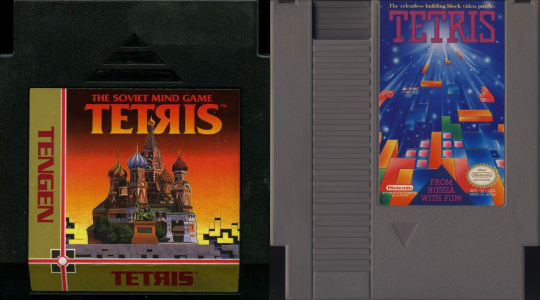 Taito version and Ubisoft version. Tengen version and Mindscape version. Licensed Tengen version, unlicensed Tengen version, and Namco version. 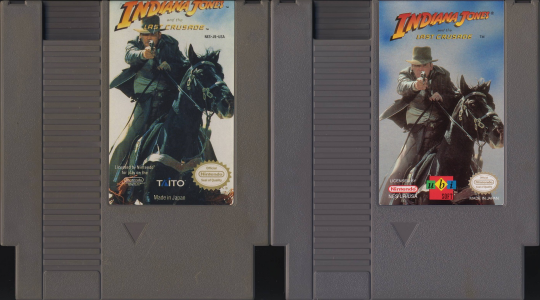 Tengen version and Nintendo version. 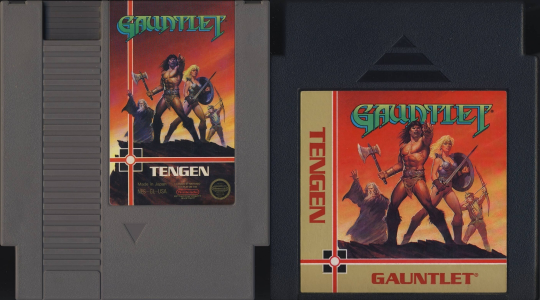 Tengen actually released three licensed games for the NES before becoming an unlicensed company, the games being Gauntlet, Pac-Man, and R.B.I. Baseball. 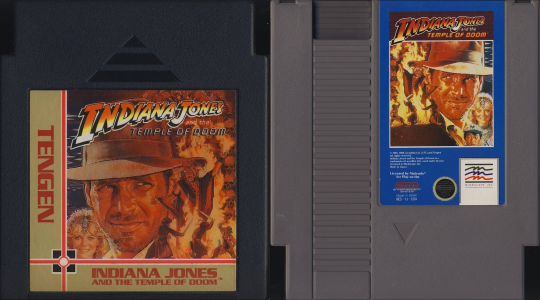 They re-released those three games in unlicensed cart shells later on. Just to make this a little more complete, here is an image of three different versions of Hogan's Alley I have come across. The first one is the original five screw version of Hogan's Alley. You can see that the top of the cart is flat as opposed to the other two that have the clips. 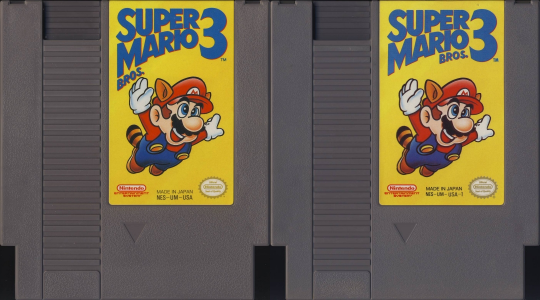 The second one is the three screw release version of the game. You can see in addition to the physical difference of the cart that it now has NES-HA-USA under the seal of quality. Well, you can see something there. It's tiny. Last, the third version has three screws, but it has the newer oval seal of quality instead of the round one. Many of the original "black box" games have variants such as these. You can also find many, many variants on the boxes to the games themselves. 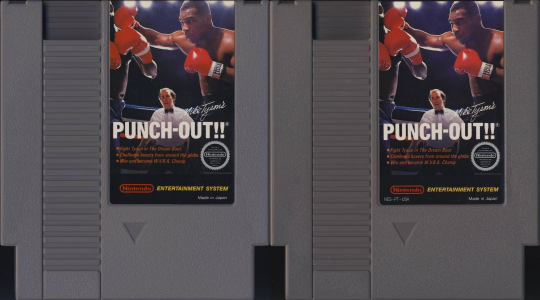 Stickers, seals, promotional coupons and more are variants that can be found on the boxes while the games look the same as any other copy. Since I don't collect boxed games, however, I don't have any of those to show. In the end, variants are an interesting thing to occupy your time with while you're hunting games. They make looking through stacks and stacks of games you already own or see frequently more fun. It's definitely not something someone who is strictly a gamer will be into or understand, but for collectors and people interested in the history of games, it's a fun diversion and interesting niche for collecting. Good article! One could drive themselves crazy trying to collect all the variants.